There is nothing more frustrating than standing in the snack aisle, surveying the selection, getting overwhelmed, and breaking down in tears. We know how hard it is to make that tough decision. We want to help you pick the perfect snack. But everybody’s taste is different, so in this series we’ll carefully evaluate each flavour and offer our opinions. Take it or leave it, but you should really buy something soon or else you’ll start looking suspicious. In this edition, we’ll look at potato chips—Lay’s and Miss Vickie’s to be specific. Lay’s Classic: An almost perfect blank slate, Classic offers comfort and simplicity. A delightful crunch and a salty potato taste that is as authentic as McDonald’s French fries. I don’t always pick Lay’s Classic as chip of choice, but when I do, I don’t think I’ve ever been disappointed. Lay’s Salt and Vinegar: This flavour proves to me that Lay’s has a pretty solid handle on subtle flavour. I’m not the biggest fan of vinegar. For some chips it’s too overwhelming for me, but Lay’s version is innocuous as long as you have a beverage close at hand. Lay’s Ketchup: Perhaps the reason I enjoy Lay’s Ketchup so much is because of its exclusivity, since the flavour is not available in the US. But no, it’s good. Not every brand can deal with the fine taste of a familiar condiment, but Lay’s tried and it’s uniquely their own. Few chips can offer the same savory experience that Lay’s does with Ketchup. Miss Vickie’s Jalapeño: A staple food growing up, Miss Vickie’s Jalapenño ignites a sudden burst of nostalgia coupled with an innocuous zig. While it was the popular choice in my high school vending machine, I must say that I have grown out of it. The spicy jalapeño flavour is dull in comparison to Doritos. Once you leave high school, you realize that there is more out there than a bag of chips that makes you cough every third crunch. Miss Vickie’s Salt and Vinegar: Not just simply salt and vinegar, but sea salt and malt vinegar—ohhh! If saltiness is what you want in chips, then S&V is your thing. It’s one step above Lay’s in flavour, which to me is too much. A few bites and I’m parched. If you pick S&V be sure to pair it with a chilled bottle of Coke. Miss Vickie’s Sweet Chili and Sour Cream: A flavour uniquely Miss Vickie’s. An epic crunch takes away from the flavourful chip. The chip crumbles in your mouth and your tongue will do its best to savour the taste, but it doesn’t last. Nevertheless, it is a delightful choice for those caught in between decisions. It has a little of everything. Verdict: There is just something special about Lay’s that’s simple and enjoyable without destroying your taste buds and churning up your stomach. Miss Vickie’s is a kaleidoscope of flavours, nothing wrong with that. But Lay’s is more of a microscope. They do the originals and secondary flavours right. Consistency is the key to a good chip. Lay’s Classic: Easily the I-can’t-believe-that’s-what-you-got of chips. Seriously? Tasteless and poor consistency. It’s a lot like their former spokesman, Mark Messier, in the twilight of his career: super recognizable, but not that good. Lay’s Salt and Vinegar: Everyone’s first relationship is an intense experience, and one that is often significantly less perfect in hindsight. Such was my time with this salty vixen. It was all fun and games when Lay’s S&V was my favourite growing up, but I’ve since come to notice the lack of substance. Always addicted to being as thin as possible, S&V never quite got the flavour-chip ratio right. Forever with a chip on its shoulder. Lay’s Ketchup: I may have it out for Lay’s, but if there’s something they’ve got right, it’s their ketchup chips. I’m admittedly more of a mustard man—where are those eh?—however, credit is given where credit’s due. Few of the more unique flavours taste even remotely similar to what they’re supposed to and the majority of taste is in the suggestive packaging, but Lay’s Ketchup really hits it near the edge of the bottle. The only reason anyone should ever pick up a bag of Lay’s. Miss Vickie’s Jalapeno: Short disclaimer before I proceed: anything even remotely spicy gets me sweating; however, I love spicy food. Miss Vickie’s Jalapeno? Not that spicy. Me? Very sweaty. An enjoyable chip that will have the average person indulging just a tad bit more than normal in their carbonated beverage of choice. Miss Vickie’s Salt and Vinegar: How a chip should be. Strong flavour without beating you over the head with it. Crunchy without being brittle. And even the bag feels more quality. Chip game on fleek. My go-to after a long day of dealing with curmudgeonly people. Miss Vickie’s Sweet Chili and Sour Cream: As mentioned in the section dealing with Lay’s Ketchup, companies often fail to get the flavour right for more obscure tastes—Vickie’s Sweet Chili and Sour Cream is one of those failures. However, by no means is this a bad chip. Inasmuch as my plebeian tongue has difficulty trying to discern what exactly is going on with this crunchy morsel, it is fully aware that it is a scrumptious confusion. Poor execution, but a fantastic mistake. Verdict: Miss Vickie’s by a production-line mile. 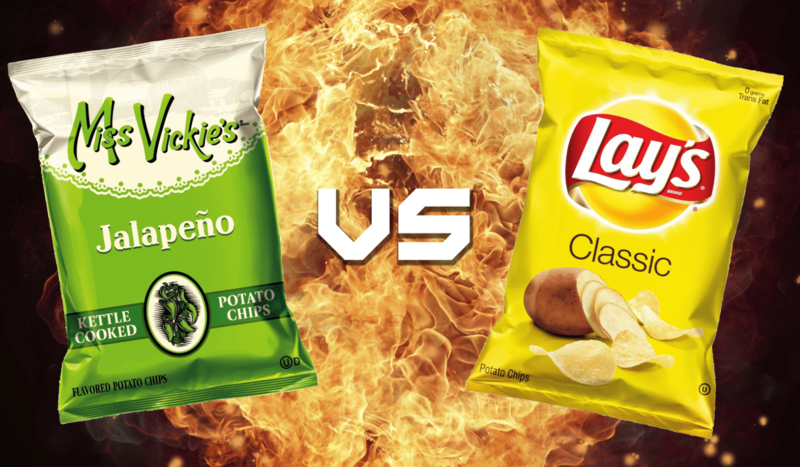 Both companies do alright in the flavour category, but a chip is nothing without the … chip. In this regard, Ms. Vickie’s easily trounces the competition. I’m not saying I’d like to change her title to “Mrs.” but Vickie’s is definitely my favourite chip.